The Mazda MX-5 RF will cost from £22,195 when it goes on sale in March 2017. Power comes from the same 1.5-litre or 2.0-litre petrol engines as the MX-5 Roadster, but the RF (for Retractable Fastback) has a targa-style folding metal top for improved refinement and security. The roof folds electronically, but leaves the rear pillars in place. The result is something between a true convertible and a targa coupe with removable roof panels. The RF has more soundproofing than the standard MX-5, so should be quieter on the road, plus it has slightly different suspension settings to improve comfort. The £22,195 starting price is for the SE-L Nav with a 1.5-litre, 131PS petrol engine, while in Sport Nav trim the 1.5 costs £24,795. The 2.0-litre costs from £23,095 in SE-L Nav trim or £25,695 in Sport Nav trim. There is also a Launch Edition, limited to 500 cars and priced from £28,995. Powered by the 2.0-litre 160PS engine, the Launch Edition gets a two-tone roof, unique BBS alloy wheels, black door mirrors and a black rear spoiler. It’s available in Soul Red or Machine Grey and also gets the Safety Pack, with lane departure warning, auto main beam and rear cross traffic alert. Inside there is Alcantara trim, plus Recaro seats. 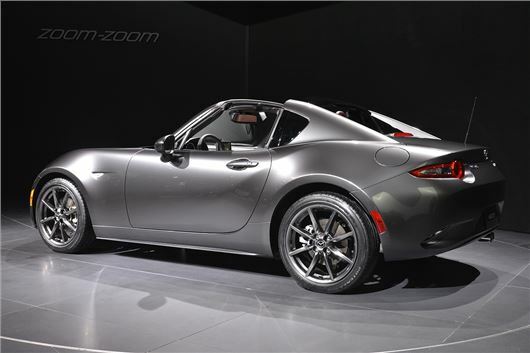 Equipment levels mirror those of the standard MX-5, but there is no SE version of the RF. That means all versions get climate control, cruise control, a colour touchscreen, navigation and Bluetooth. Top Sport Nav models gain auto lights and wipers, reversing sensors, heated seats and leather upholstery. The RF is available with an automatic transmission – unlike the standard MX-5. It is available linked to the 2.0-litre 160PS engine only, and is sold in top Sport Nav trim only, priced at £27,095.